Calgarians who normally use 36 Street in the northeast may need to rethink their commute as a section of the road is closed for construction. The project that begins on Monday is part of the ongoing airport tunnel work. 36 Street will be closed between 80 Ave. and Country Hills Boulevard for the next four months. During that time, crews will be expanding the road from two lanes to four. Drivers who use 36 Street should use Metis Trail as an alternate route. Crews say they have all of the concrete for the 620 metre long tunnel poured and are working on electrical and mechanical work. The roadwork inside the tunnel also needs to be completed. The City of Calgary says that most of the roadwork will be done this year and it expects to open the tunnel, which runs between Barlow Trail and 36 Street N.E., in May 2014. The project’s budget is $294.8 million. 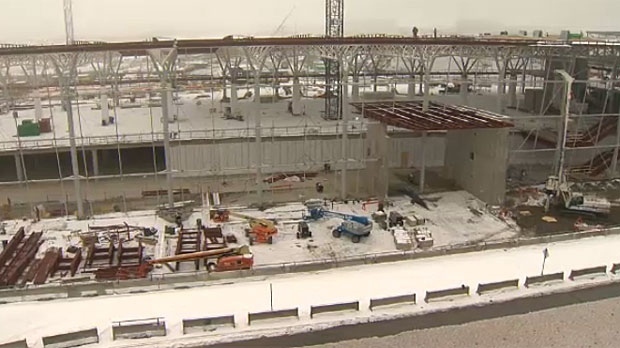 Work continues on the northeast airport tunnel as city crews have closed 36 St. N.E. between Barlow Trail and Country Hills Blvd. for upgrading.